Both approaches can get you to "the other side." But counting calories is like frantically zigzaging through a minefield. Eating more and exercising less -- but smarter -- is as natural and low key as strolling through a meadow. Starting in the 1970s, diet and nutrition experts reduced food and exercise down to a lowest common denominator: calories. They told us that we just needed to eat fewer calories and exercise more to burn them off. We were told that it didn't really matter what we ate. "There are no bad foods," they said, "only bad quantities. Everything in moderation." In this same spirit, many experts claimed the type of exercise we do is irrelevant -- as long as we get our heart rate up for a certain amount of time so that we burn a lot of calories. Judging by these results, the calorie-counting approach is not effective. We're trying, but it's not working -- anywhere. The worldwide rate of obesity has more than doubled since 1980. The number of people who are overweight today equals the total world population a century ago. Most disturbing, David S. Ludwig M.D., Ph.D., director of the New Balance Foundation Obesity Prevention Center Boston Children's Hospital, reports: "Obesity is such that this generation of children could be the first basically in the history of the United States to live less healthful and shorter lives than their parents." In the words of Dr. Susan Wooley, co-founder of the Eating Disorder Clinic at the University of Cincinnati College of Medicine: "The failure of [heavy] people to achieve a goal they seem to want -- and to want almost above all else -- must now be admitted for what it is: a failure not of those people but of the methods of treatment that are used." While this is heartbreaking, there is hope. The counterproductive results brought upon by the misinformation of the past have led contemporary experts -- people who spend their time in research labs, not on television or in magazines -- to seek out an alternative. These experts knew we couldn't begin to find the answer until we were ready to admit the fallacies of those old theories. "How may the medical profession regain its proper role in the treatment of obesity?" Albert Stunkard, M.D., chairman of the Department of Psychiatry and founder of the Center for Weight and Eating Disorders at the University of Pennsylvania, asks. "We can begin by looking at the situation as it exists and not as we would like it to be ... If we do not feel obliged to excuse our failures, we may be able to investigate them." This realization within the scientific community has been wonderful for us because it led to decades of transformational fat loss and wellness research. The only issue is that this research, buried in dense medical journal articles and research papers, has not yet found its way out of academic circles. I've set out on a mission to fix that, and today I'm seeing a growing number of experts and health-enthusiasts embracing the same mission. That's encouraging. Because once we simplify this science and dispel the misperceptions, we can escape the myths at the heart of the obesity, diabetes, and heart disease epidemics. And then millions of us will experience something truly liberating: We will see how accurate information makes it easy to get slim and be healthy. I realize it sounds a little too good to be true. But at some point, haven't you met one of those maddening individuals who can eat as much as they want, not exercise, and still stay slim? We all have. So the question is not: "Is simple lifelong slimness possible?" Millions of naturally thin people have already demonstrated that it is. The question is: "How can I burn fat automatically, like naturally-thin people?" The modern science of health and fitness has revealed a surprising and encouraging answer: We don't need to eat less and exercise more (harder). We can eat more and exercise less -- smarter. Smarter is the key. The focus should be on food and exercise quality instead of quantity. By eating plenty of higher-quality food and doing less (but higher-quality) exercise, we unconsciously avoid overeating and provide our body a unique combination of nutrition and hormones, one that reprograms the body to behave more like one of a naturally-thin person. Millions of us have been literally dying to know the facts about fat loss and health, but as noted, over the past few decades those facts have not made their way into the mainstream. It took me over a decade of being sleep deprived, sending countless emails, and calling researchers around the world to understand and integrate over 1,300 nutrition and exercise studies into a proven, modern approach to eating and exercise. I don't want to see others invest a decade or more in seeking out and absorbing this same information, and that's why I'm sharing it in my blogs and also in my forthcoming book, The Calorie Myth (Harper Collins, 12/31/13). To be clear, the "eat less, exercise more" approach can work -- just not very often, easily, or enjoyably. And not very sustainably, either. Studies show that 95.4 percent of the time, counting calories does not keep off body fat over the long term. To put that into perspective, quitting smoking cold turkey has a 94.5 percent failure rate. Put these two facts together: We are more likely to give up the third most addictive substance in the world (trailing only heroin and cocaine) without any help than we are to shed weight using the "gold standard" advice you have been taught your whole life (the gospel of what I was taught back in my personal trainer days). The modern smarter approach is not about better vs. worse, but simple vs. complex: When we're hungry, we eat smarter foods until we're full. When we work out, we do smarter exercise for a shorter period of time. That's it. Freed from hunger or complicated calculations about how much we're eating or exercising, we can spend our energy on our dreams, jobs, and families. The calorie-counting model is so complex that there are reality TV shows about it, with contestants constantly doing food math and spending life-draining hours in the gym. Worried about how much we're eating or exercising, we have little time or energy for anything else. To get started eating more, exercising less, losing weight, and living better, enjoy the video below. Petersen CB, Thygesen LC, Helge JW, Grønbaek M, Tolstrup JS. Time trends in physical activity in leisure time in the Danish population from 1987 to 2005. Scand J Public Health. 2010 Mar;38(2):121-8. Epub 2010 Jan 11. PubMed PMID: 20064919. Oliver, J. Eric. Fat Politics: The Real Story behind America's Obesity Epidemic. New Ed ed. New York: Oxford University Press, USA, 2006. Print. Nestle M, Jacobson MF. 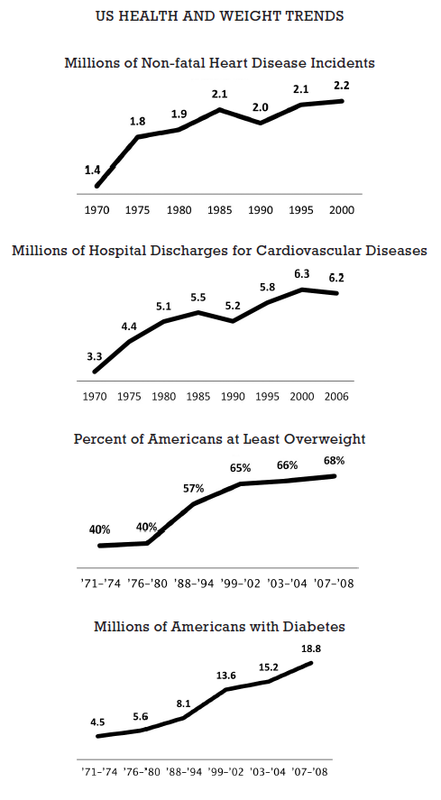 Halting the obesity epidemic: a public health policy approach. Public Health Rep. 2000 Jan-Feb;115(1):12-24. PubMed PMID: 10968581; PubMed Central PMCID: PMC1308552. 3. Wooley, SC, and DM Garner DM. "Dietary Treatments for Obesity Are Ineffective." BMJ. 1994 Sep 10; 309(6955) (1994): 655-56. ; PubMed PMID: 8086992; PubMed Central PMCID: PMC2541482. 4. Stunkard, A., and M. McClaren-Hume. 1959. "The Results of Treatment for Obesity: A Review of the Literature and a Report of a Series." Archives of Internal Medicine. Jan.;103(I) (1959): 79-85. 5. Crawford D, Jeffery RW, French SA. Can anyone successfully control their weight? Findings of a three year community-based study of men and women. Int J Obes Relat Metab Disord. 2000 Sep;24(9):1107-10. PubMed PMID: 11033978. Summerbell CD, Cameron C, Glasziou PP. WITHDRAWN: Advice on low-fat diets for obesity. Cochrane Database Syst Rev. 2008 Jul 16;(3):CD003640. Review. PubMed PMID: 18646093. Pirozzo S, Summerbell C, Cameron C, Glasziou P. Should we recommend low-fat diets for obesity? Obes Rev. 2003 May;4(2):83-90. Review. Erratum in: Obes Rev. 2003 Aug;4(3):185. PubMed PMID: 12760443. "A word about quitting success rates." American Cancer Society :: Information and Resources for Cancer: Breast, Colon, Prostate, Lung and Other Forms. N.p., n.d. Web. 11 Jan. 2011. Johnson D., Drenick E. J. (1977) therapeutic fasting in morbid obesity: long-term fellow-up. Arch. Intern. Med. 137:1381-1382.